Well, folks, with commencement season well upon us, we'd all be more than a bit remiss if we didn't send up a good word to those among us who, over the next few weeks, will get to take their victory lap, collect their piece of paper (and, in more cases than not, the boatload of debt that comes with it) and finally head on to that great big "Next Thing"... whatever in the world it might be. So, to the grads among us, all congrats and then some. Soak it up; don't worry too much about the road ahead -- it'll all sort itself out; just have fun... and really, fully, in the truest sense of the word, live the dream... because, whatever yours is, it's in you for a reason. As previously noted, first felicitations 'round these parts belong to my little sister, who takes her walk in the morning... four years to the day when I took mine (...as sighs of relief abounded all around. No joke). This might just be the moment when your narrator starts feeling "old." But oh well... it was bound to happen sometime. Then, Sunday afternoon in South Bend, Notre Dame's 163rd commencement is a two-fer of a different sort, as Martin Sheen receives Stateside Catholicism's highest honor, the Laetare Medal, and DC's own Cardinal Theodore McCarrick delivers the main address (as Touchdown Jesus presides from outside). I want to invite you, for just a moment, before the commencement ceremony and the celebrations that follow, to pause and think: what was the reason that brought you here? What did you hope for? What did you do in these years? What did you gain? The answers to these questions, along with the degree that represents your academic and professional achievements, are the things that you will take with you. Cognitive psychologists and those who study the functions of the brain tell us that much of what you studied or read in these years --- not all, but much of it --- will quickly be forgotten. If that is true, then tonight, permit me to ask you, the graduating class of 2008 of The Catholic University of America, a somewhat deeper and more enduring question: what have you become here? Have you changed? Are you a different person from the young woman or man who first arrived? These are important questions to ask and to answer. At this moment, however, as the class of 2008, you are here in this Basilica with your parents and families, your classmates and friends. In this celebration of the death and resurrection of the Lord Jesus Christ that we call “the Eucharist,” the sacrifice of the Mass, let me pose another question that may sound strange to your ears. In light of today’s Gospel, let me ask you. In your time at The Catholic University of America: what did you lose? What did you lose by what you have gained and become here? I say “more than a bit of irony” because what you hear in Jesus’ words tonight is not simply some Christian “throw away line” or some fact presented in a class lecture or a reading assignment that we can easily forget. It is the fundamental call of the Lord Jesus Christ to you who call yourselves Christians. No matter what degree you have earned or subjects you have studied or honors you have received--- and those are all good and wonderful things --- for the believer, for the Christian, it always comes back to the same reality: hearing the call to follow him. No matter what reason brought you here to The Catholic University of America, it is that message that we emphasize as you leave, it is the conclusion to your experience. What you have truly gained and become is the result of what you have lost. It is my hope, our hope, that since you first arrived here at Catholic you have lost the belief that you have all the answers, that you are self-sufficient, that your parents and elders are irrelevant and have nothing to offer, that everything you need to know, you can find on “Facebook” or “YouTube” or simply by asking those who think just like you do. That Church was something you “did” when you were younger but that you have outgrown it. It is my hope, our hope, that since you first arrived here at Catholic you have lost the inclination not to turn first to Almighty God in your need, not to make room for others in your life because of selfishness and self-centeredness, not to care and to love and to see that faith is more than just clinging to externals, as St. James points out in the first reading: what good is it to say you have faith if there are no works that flow from it? On the eve of your graduation, you and I both know what you have gained here --- and you have gained much in your classes and studies, your friendships and experiences, your growth in faith and compassion. And you and I both can also see what you have become here --- and it is “beautiful, good and true.” Be joyful. Be happy. Be grateful. Live your life: it’s God’s gift to you. Love your life: it’s your gift to God. Lose you life for his sake and that of the Gospel: it’s your gift to the world through him. Amen. The test of this university’s Catholicity, the evidence of its success is ultimately validated in its graduates if it is to carry any credibility whatever. Benedict XVI’s standard for an education that is truly Catholic would be found not only in orthodox teaching or student numbers but, in his words, in “the joy of entering into Christ’s being for others.” It’s what the hundreds of crucifixes call out to you daily as you pass them by on this campus: only the one who gives his life for others, for Christ and His Gospel, will find it. How much of yourself are you willing to surrender to sacrifice for a higher good? And what is that good if not knowing and doing the will of God? 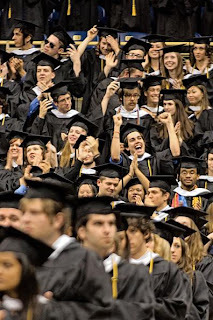 If the bicentennial graduate of Mount St. Mary’s University is driven by the engine of self-seeking and self-interest, that graduate has failed this institution and its traditions. Your challenging academic pursuits these years at the Mount have led to many discoveries. Albert Einstein held that true education is what remains long after you have forgotten everything you have learned in the classroom. It was on one of Simon Garfunkel’s subway walls that while in New York recently, I saw an advertisement for an on-line course in practical philosophy. The poster on the wall posed questions that you are on the way to answering as bicentennial graduates of this university so thoroughly Catholic. Who am I? What is my purpose? How can I realize my potential? …truth is not an imposition. Nor is it simply a set of rules. It is a discovery of the One who never fails us; the One whom we can always trust… ultimately truth is a person: Jesus Christ. Bicentennial graduates: Have you discovered or perhaps re-discovered Jesus Christ here? And will you share that discovery with others as you depart with your Mountain memories? Do you believe that he is the only ultimate measure of the truly human being? Do you find in him, in his life, his preaching, his example the model of true leadership? What does it mean to lead and to be a leader? It means to know where you are headed and how to get there. What leaders have you looked up to to reach this point in your life? A recent book’s title suggests that when the truth is compromised, leadership will be absent. The title, “Ten Things Your Minister Wants to Tell You (But Can’t Because He Needs the Job).” Or, in political accent: find out where the popular movement is marching, and get right out there in front. In a society polarized in virtually every sector, where one person’s hero is easily another’s villain, only lives of truth in action—the heroism of 9/11 for instance—will find credibility among people of good will. The timid move in crowds. Leaders do not. Speak up for life, for the poor, for the outcast in our midst—or what has this education been for? I suspect you have discovered a community here at the Mount that you will not easily find elsewhere. Note its hallmarks, shared values, pains, and joys. Respectful listening, trust one for the other and cheerful self-sacrifice. A joyful, contagious spirit permeates the temper of this campus—and, seemingly, always has. On this Pentecost, I would call it the Holy Spirit. That each of you has been enriched by this unique spirit is as much part of your education as have been your academics. Now take that spirit and spread it, transplant it into the arid soils where your next steps lead you. Again, to all our grads, congrats, Godspeed, and now and always, all the good luck and great happiness in the world. You did it! 75 Years, Still "On Pilgrimage"